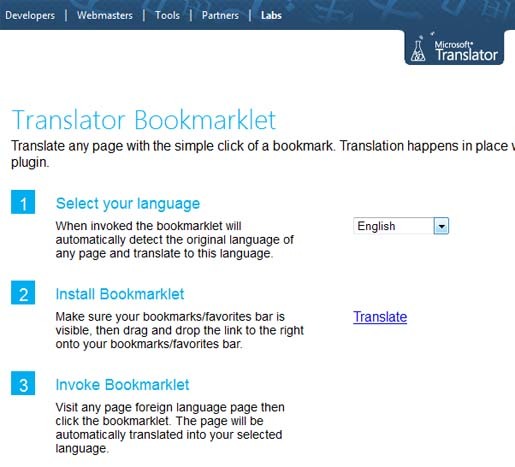 Now, you can have translator bookmarklet from Microsoft. The name of the feature is Microsoft Translator Bookmarklet. The bookmaklet has been especially designed for web browsers and it will be added to your favourites bar for translating the web pages to foreign languages in moments. You can get the translation on the same page. Therefore, it isn’t required to leave the page with the help of this light-weight, java script and cross-browser plugin. Just visit the Microsoft Translator site, select the language you wish to have for the web pages. Then, you can simply drag and drop the bookmarklet onto your bookmarks or favourites bar. You can have the bookmarklet in more than 36 languages. After setting the language to any webpage, you can simply click on the bookmarklet to have it in the configured language when you visit again. This feature will be very useful for the users of Internet Explorer, Firefox and Safari. At the same time, it will not be such good for the Chrome users as it has already have a builtin feature.